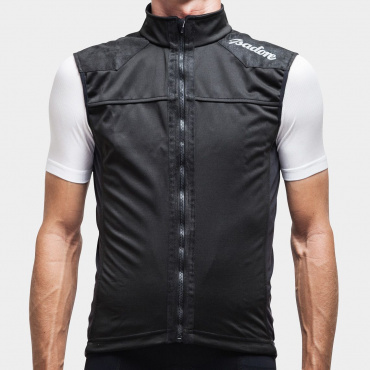 Save on the piece of garment that can make the difference and make you feeling totally comfortable on your ride in the widest range of weather conditions. Combining natural characteristics of Merino wool and sensitively developed short sleeve cut bringing you this key part of your apparel. Constructed from 140g/m 100% Merino Wool fabric. Odor resistant, excellent perspiration wicking and thermoregulation. Slim fit but comfortable enough cut to feel free when moving. 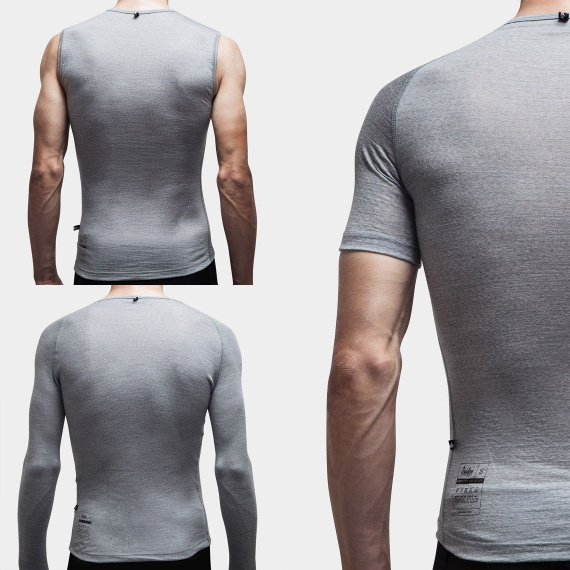 So soft on touch and itch free it will make you want to wear this Isadore base layer even when not riding your bike. Comes in two naturally subtle colors, black and flecked grey. Label and tags free to avoid any discomfort with extra collar and side eyelet to safely drive the cables from your favorite tunes player. Very slim fit design. If you prefer standart fit, we recommend you to take one size bigger. High quality and delicate material, that deserves careful maintenance. We strongly recommend cold hand washing and strictly no tumble dryer. I love the long sleeve baselayer, it's very warm and comfortable. The sleeveless baselayer it's very comfortable as well. But the short sleeve one it feels very slim fitted (I'm size L) and a little itchy. I haved to return it. 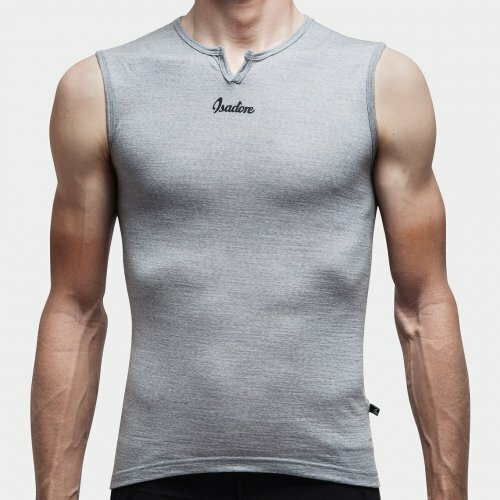 Merino is a great material for a base layer - and Isadore merino is more pleasant to wear compared to some other brands. The feel is further enhanced by absence of any stickers. LS, SS, SL - great trio for any weather condition. Essential addition. 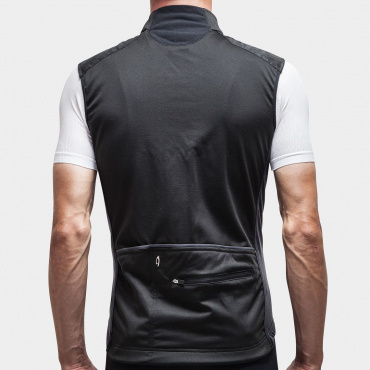 The long,short and sleeveless base layers are perfect worn under a variety of Isadore tops in a variety of weather conditions and at a reasonable price. These are perfect base layers. The fit is tight and the length just right. I can only recommend all three base layers in this package. 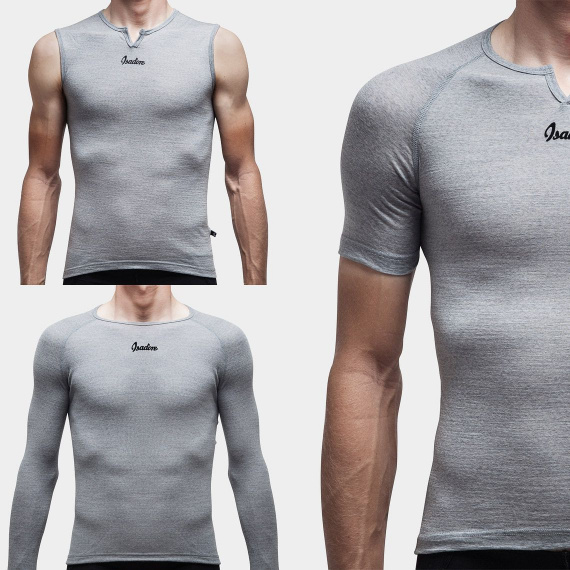 These merino base layers are great value, superb quality and they even look cool. As usual, the customer service is prompt and friendly. Another highly recommended product from Isadore. Veľmi príjemný materiál, nátelník s dlhým rukávom je príjemne teplý. Veľmi pekný dizajn. Kvalitné spracovanie. 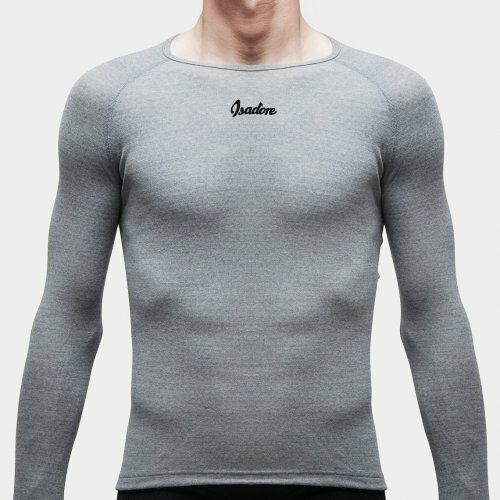 Sehr angenehm zu tragende Baselayer für alle Jahreszeit passend. Komisch finde ich nur, dass alle drei Teile total unterschiedliche Längen haben. Das Langarmshirt reicht grad so bis zur Hüfte und mit kürzer werdendem Ärmel wird die Shirtlänge immer größer - nicht nachvollziehbar. Trotzdem einfach ein klasse Set, hoher Tragekomfort mit gutem Feuchtigkeitstransport. Guter Baselayer : Klima und Trockenheit angenehm. Fühlt sich für mich jedoch ab und zu noch kratzig an bin da jedoch ein Sensibelchen ;-) Beim Fahren geht das dann aber eigentlich weg es stört nicht wirklich. Sie tragen sich extrem angenehm auf der Haut, halten super warm, und sind schnell wieder trocken. Ein unbedingtes "Muss" für untendrunter. Größe M bei 184 cm und 76 kg sitzt wie angegossen. Ich fahre noch nicht lange Rennrad. Wie wichtig ein guter Baserlayer ist, habe ich aber schnell gelernt. 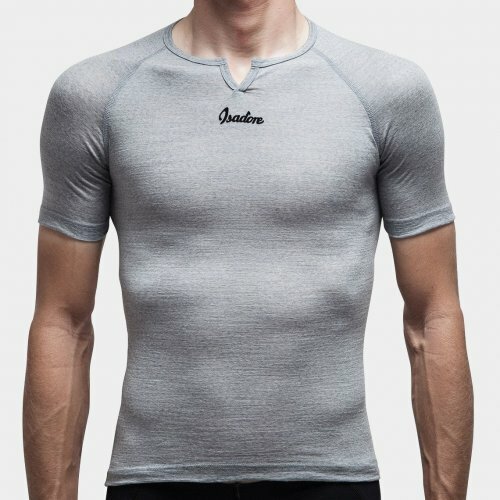 Die Baselayer von Isadore sind sehr angenehm auf der Haut und kratzen überhaupt nicht. Zwei der Shirts zeigten schon nach dreimal Waschen erste kleine Risse am Kragen. Jetzt nach eineinhalb Jahren sind die Shirts komplett durch. Schade.